One story homes don’t have to limit you. Sometimes one story homes can get too large to maintain effectively, making them more work than you may want. At Mark Stewart Home Design, we take extra care to make sure every one story home is laid out thoughtfully, accessibly, and logically. By placing the living space in the center of the home, we are able to place all the bedrooms around the central gathering area, ensuring every one has equal access to the common spaces while still having ample privacy. This home features tall ceilings throughout, with 11′ ceilings in the casita living room, great room, and study, and 9′ ceilings in the dining room, kitchen, and casita bedroom. A modest gallery hallway leads to the left side of the home and its two bedroom suites, utility room, and garage access, while the right side of the home is dedicated to the expansive master suite and expanded casita. The central portion of the home is where you’ll find the study, the kitchen with its immense pantry, the formal dining room, and the lovely great room with access to the outdoor living space. The master suite has everything you could want, with a beautiful tray ceiling, sliding barn door to the master bath, separate tub and shower, and oversized walk-in closet. The casita at the front of the home has french door access via the foyer, and includes its own private living space, full bath, and bedroom with a 9′ ceiling. This space is perfect as a rental, extended stay guest suite, or bonus creative space. 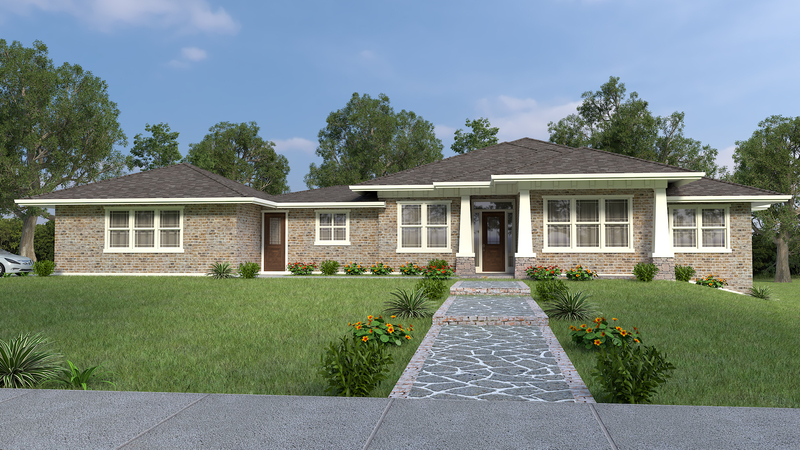 Learn more about our casita house plans and what makes them special here.